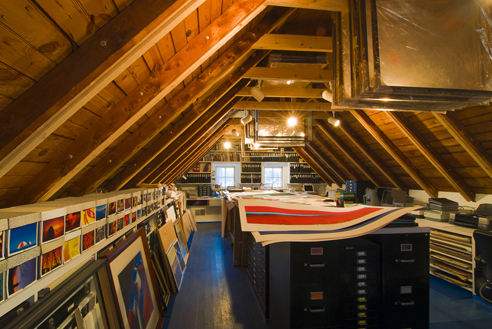 Alison Shaw Photography is located in an upstairs loft space above our gallery at 88 Dukes County Avenue, in the heart of the Arts District in Oak Bluffs. In case the gallery's not open, ring the doorbell around the side of the building, and we'll be happy to invite you in and show you the gallery and studio space. Or call ahead to make an appointment (508) 693-4429. Sue runs the gallery, does our design, writing, marketing, and consults in all areas of the business. She's designed a couple of Alison’s books, and other client projects as well. A graduate of Smith College (1984), Sue also has an M.A. in publication design from the University of Baltimore and the Maryland Institute of Art. After just over a year at the Vineyard Gazette (where she and Alison met in 1986), Sue was the art director of a chain of weekly newspapers in the Boston area. She then spent seven years as a designer at The Boston Globe, and later a couple of years as the art director for Martha's Vineyard Magazine. Sue loves working with people, and is usually seen behind her desk in the gallery just as you walk in. She’s also our resident klutz (her word), so she tries to stay clear of prints in process upstairs. Sue, Alison, their two teenagers, and three cats live in Oak Bluffs. Claire has worked at Alison Shaw Photography since the fall of 2001. She manages the daily operations of the studio, including printing Alison's images, maintaining inventory, matting and framing prints, and handling card, poster, and print orders. She’s a crucial part of our team, consults on many of our important decisions, and brings an artist’s eye to her work. Claire graduated from Loyola College in Maryland with a BA in Communications. She worked in the printing industry in Boston for several years before relocating to Martha's Vineyard. She doesn’t miss a day at the gym, and loves following pro sports and being on her boat. She and her husband live in Vineyard Haven with Bailey, their cocker spaniel. Carol has framed all of Alison’s large prints for over 20 years. She is an expert framer, and an artist who spends every spare moment in the garden. She shares her love of pro sports with Claire – the two of them know more about teams and strategy than anyone else we know. She also holds a razor blade in her teeth while working (keeps it handy). Carol lives with her partner, a fine art photographer, in Vineyard Haven.